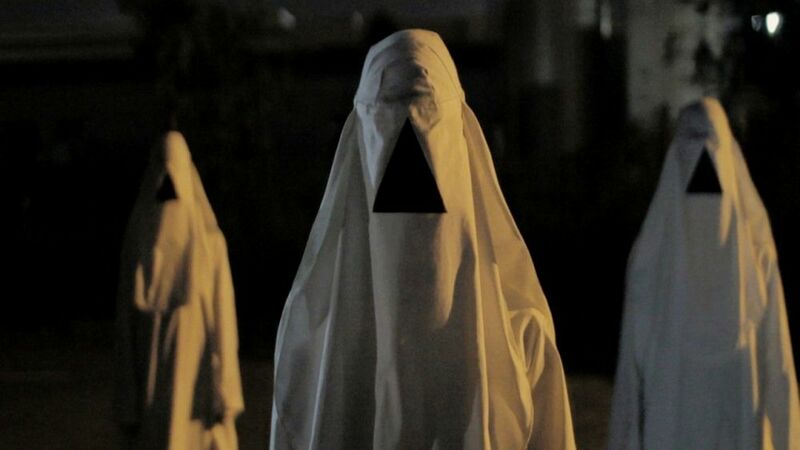 I've been meaning to watch The Void all year so when it popped up on Shudder I just had to give it a watch. This was a bit of a hotchpotch one in that it reminded me of a lot of different films, there were traces of Hellraiser and The Thing in its creature design, while the gist of the plot drew many similarities with Turkish horror Baskin, The Beyond, and even Event Horizon. The special effects for The Void are fantastic, I loved all the gruesome monster mutations that seemed like a cross between the Necromorphs from video game Dead Space and The Thing from that film. These are coated in slime, have writhing tentacles and additional limbs and heads growing out from their cancerous mass, with it seeming the original host has been assimilated . I loved these practical special effects with the camera and lighting helping to make these seem chaotic with much of the monsters hidden in darkness, or with close up shots. The set design is another aspect of this that added to the atmosphere with some effective looking locations in the basement of the hospital. This was where the similarities with Baskin come to the fore though, in that film a bunch of policeman find a gateway to Hell in the basement of an abandoned building, here a policeman finds a gateway to Hell in the basement of a pretty much deserted hospital. As such when we start seeing random creatures scuttling around and corpses hanging from ropes I was immediately reminded of similar scenes there. My problem though with The Void come from the story itself, at its heart it is something straight out of Hellraiser, but here all the characters are pretty irritating and annoying. Daniel spends the film getting attacked and insulted by pretty much everyone, having no authority at all. Allison is the worst character and I hated how she was used to propel the plot forward. At one point she wants to go off into the monster infested hospital alone to get some medicine for a pregnant girl, Daniel tells her to hold on so that he can return to his patrol car to grab a shotgun and go with her. He goes to the car and returns less than five minutes later to find she has gone off anyway and subsequently got kidnapped as a result; infuriating! I couldn't care less about her after this and as such the rest of the film devolved into a rescue mission for someone who frankly deserved to be kidnapped. The cinematography during this film was great but in terms of the lighting it was often pretty hard to tell what was going on lending the film an abstract tone to it as travelling from place to place often seemed confusing. Visually this was on point all across the board but it was the story that took away from this. As a horror this works fine, I found myself engaged in the situation even if I didn't actually like anyone. The cultists surrounding the building were a creepy sight, but their relation to anything else seemed a bit distant, they never really appeared in any scenes with the monsters and so felt separate and a little bit disjointed. I didn't find this a boring film to watch though, there is always something new going on with none of the scenes dragging. I liked how backstory for the angry Dad and his son was provided by the characters finding themselves in an illusion, rather than an actual flashback being used, but for the main antagonist and other characters there was less exploration of their past. 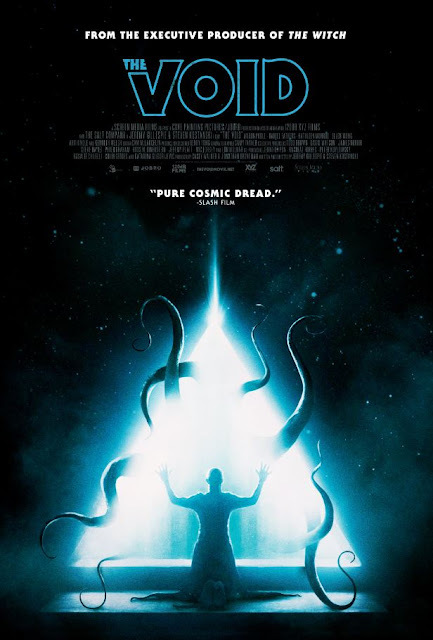 The Void looks great and has some really awesome looking practical effects, and creature design, however as a horror it felt a little bit too derivative of films that had come before and so I found myself constantly being reminded of other movies rather than caught up in the moment. It would have also been nice to have at least one character that I actually cared about, but least the acting is fine throughout the cast. The Void isn't a bad horror film and was a fun ride, but it's not really something that I feel will stick around in my head for too long.